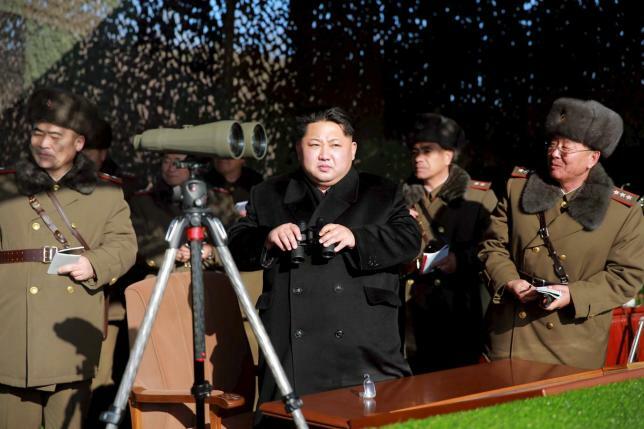 North Korean military has tested a new high-performance rocket engine, the state media says. Kim Jong-un declared the test “a new birth” for North Korea’s rocket industry, state news agency KCNA said. The North Korean leader said the engine would help his country achieve world-class satellite launch capability, it added. The development, not confirmed elsewhere, comes as Secretary of State Rex Tillerson visits China – Pyongyang’s main ally. After personally overseeing the test, Kim Jong-un “emphasized that the world will soon witness the great significance of the epoch-making victory we achieved today”, KCNA reported, adding that it marked the birth of the country’s rocket industry. Rex Tillerson’s East Asian tour has been dominated by anxieties over North Korea’s nuclear capabilities. In South Korea on March 17, the secretary said a US military response would be on the table if North Korea threatened South Korea or US forces. The US and China pledged to work together to get North Korea to take “a different course” and move away from its weapons programs after Rex Tillerson met his Chinese counterpart on March 18. North Korea has conducted five nuclear tests and a series of missile launches. Experts and government officials believe it is working to develop nuclear-warhead missiles that can reach the US. Kim Jong-un has said North Korea is close to a test-launch of an intercontinental ballistic missile.